You can save time and money on airport parking at Charleston International Airport (airport code CHS). By booking Charleston airport parking before you even pack your bags, you will not have to worry about getting to your flight on time. No waiting on buses or counting on friends – you can drive your own car to the airport, and then not even have to spend time searching for a parking space. 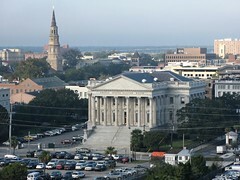 Charleston International is nine miles of northwest of its namesake city, Charleston, South Carolina. It is South Carolina’s busiest airport. There are a handful of restaurants and snack bars if you get hungry while you wait for your plane, as well as some gift shops and a hospitality counter. The airport shares two runways with the Charleston Air Force Base. For traffic information, visit South Carolina’s Department of Transportation website here. Taxi: Taxi fares from downtown to Charleston International are approximately $25. Bus/Shuttle: A downtown-departing bus is available near the passenger pick up area. Planning a long drive to or from the airport, or an odd-hours flight? Check out Charleston Airport (CHS) park and sleep hotels. Don’t fancy driving to the airport? Or leaving your car there and paying for parking? Catch a shuttle to Charleston airport.